Foot-Numbing Spray: Myth Or Miracle? Over the last couple of weeks, beauty blogs have been blowing up with news of a “miraculous” new product for high heel lovers who would rather not sacrifice fashion for comfort. 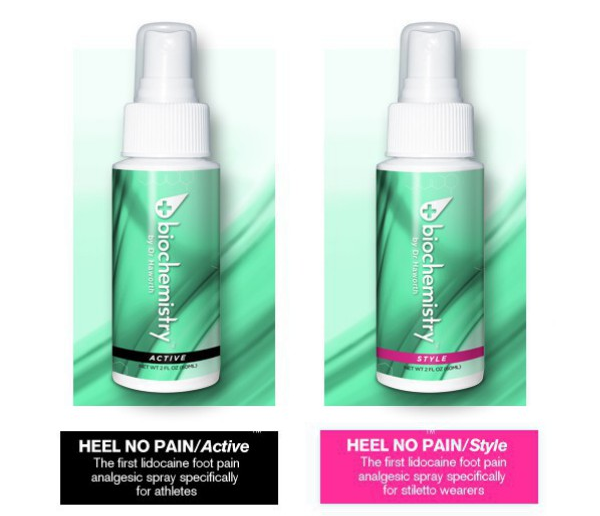 Heel No Pain is a foot numbing spray developed by a company called Biochemistry, run by New York plastic surgeon Dr. Randal Haworth. So is this new product just what we’ve been waiting for… or another crafty marketing gimmick? The Heel No Pain spray will be available online during its initial roll-out this month. Soon you will see 1 ounce handbag size bottles for $15 and larger sizes for $32 on shelves at Foot Locker and at Walgreens, according to The Daily Mail. The product uses lidocaine HCI anesthetic and is “designed to penetrate” through the thick sole skin to numb the nerves that transmit pain within 15 minutes for up to three hours of relief. It can be applied up to four times a day. The doctor predicts his revolutionary new spray will become “as popular as Tylenol.” Is it truly “a whole new way to stay happy in your heels” — or is it just a clever way of masking the pain? The product comes in two sizes, with “style” and “active” formulas. “The cause of arch pain is multifactoral,” explains Dr. Geldwert, a NY podiatrist at The Center for Podiatric Care and Sports Medicine in Manhattan. He adds that a numbing spray can, at best, affect the nerves but will not address structural issues such as flat feet, collapsed arches, worn fat pads, plantar fasciitis, and inflammation that are really causing all that pain. Should conservative care fail, the doctors at the CPSM are adept at performing reconstructive flatfoot surgery for the relief of patients’ protracted arch pain. He emphasizes that it’s important to listen to and receive any signals the body is sending you, rather than just try to stop the transmission. Without rest and treatment, problems like foot pain tend to get worse over time, until it’s too late to help with conservative methods. Dr. Haworth says his foot-numbing spray is effective on 70% of the people who try it. A New York City event manager who sampled the product said two applications really changed her day. “Obviously the discomfort of wearing heels doesn’t just magically disappear, but the pain that makes you want to take your shoes off, or sit down — was gone,” said Sophie Potts.